The controversial 50-50 recruitment process for the PSNI ends on Monday after 10 years. The process was introduced as part of the Patten policing reforms and was aimed at increasing the number of Catholic officers. When it was first introduced, Catholics made up about 8% of the police. 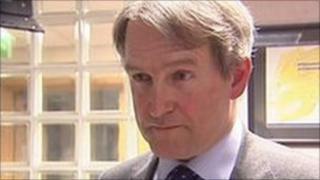 Secretary of State Owen Paterson said that with almost 30% of officers now from a Catholic background, the practice could no longer be justified. Nationalist politicians have viewed it as a success, but unionist politicians claimed it unfairly discriminated against Protestants. DUP MP Jeffrey Donaldson said he was glad to see the end of "institutionalised state-sponsored discrimination in the 21st century". He said it was "wrong" to prevent someone who has the qualifications for a job from "doing it simply because of their religious affiliation". "I have met many young Protestants who applied to join the police, who went through all the exams and assessments and got into the merit pool and then were told 'I'm sorry you can't be a police officer because you are Presbyterian, Church of Ireland, Baptist, Methodist'," he added. "I have had young people in my office in tears because their future was being determined on a base sectarian decision." SDLP Assembly member Alex Attwood said he understood the issue had been difficult for unionists, but that there was "every justification for continuing the policy". He said the Patten Commission had recommended that "50-50 recruitment remain in place for 10 years at least". "This is not sectarianism, this is a positive discrimination measure approved by the European authorities in terms of a critical public service after years of conflict," he added. "People recognise that getting policing right was crucial for moving Northern Ireland forward and getting the number of Catholics in the police right was crucial as part of that strategy." Sinn Fein's policing spokesman Alex Maskey said he "rejects totally" the move. "Clearly progress has been made in relation to policing, but that has been slow and painstaking; collectively we still have some way to travel yet," he said. "I welcome that more people across the community have been willing to give the PSNI a chance in recent times. "However, the onus remains on the police to engage with communities, build confidence within communities and the composition of the police is an essential element of this process." Ulster Unionist Leader Tom Elliott has welcomed the secretary of state's announcement. He said it would "end the deliberate bias in the selection system against anyone who is not from the Roman Catholic community". "Police officers in Northern Ireland should be recruited on the basis of being the best person for the job," he said. "Nowhere else in the democratic world would have tolerated such discrimination for so long and I'm glad that the provisions have finally ended and the principle of merit restored."